When you’re looking to maintain a clean and finished look at your business, look no further than Best Way Carpet and Tile Cleaning. At our NJ floor waxing company, we offer commercial waxing services to meet the needs of our customers, ensuring that your business is always ready for clients and customers. Commercial floor waxing is a great option for business owners looking for a way to protect and maintain a beautiful finish for their tile floors. Commercial floor waxing will ensure that your business gives a clean and shiny appearance all year long. The trained professionals at Best Way Carpet and Tile Cleaning will begin the process by removing the old finish and dirt from your entire floor. 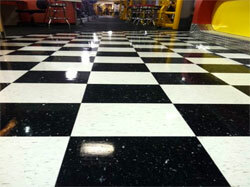 Once completed, the application of a high-grade floor wax will be applied to the entire floor. Generally 3-6 coats are applied, depending on your needs and desired look. Our trained technicians will ensure that your floors shine like new. When you work with the team at Best Way Carpet and Tile Cleaning, you can be sure that you are working with a staff that has your best interests in mind. We tailor our services to your needs, thus, guaranteeing you’ll be impressed with the outcome. Vinyl commercial tiles are a fantastic option when choosing a look for your business, but they can get dirty quickly. Commercial floor waxing in NJ is a great way to keep your vinyl tile floors clean. Whether you’re in a retail space, office building, school or any commercial space, we will customize the waxing process that best suits your needs. Working with Best Way Carpet and Tile Cleaning can ensure that your business is always clean and ready for clients and customers. With a variety of both commercial and residential services, your NJ floor waxing company can help. To learn more about our services or to speak to a representative, give us a call at 732-391-6500 and visit us online at bestwaycleaning.net. This entry was posted on Tuesday, June 11th, 2013 at 11:14 am and is filed under Floor Waxing.